NOTE: вЂў Before doing this troubleshooting procedure, review SRS Precautions and Procedures (see page 24-25), General Troubleshooting Information (see page 24-36), a n d Battery Terminal Disconnection and Reconnection (see page 22-91). 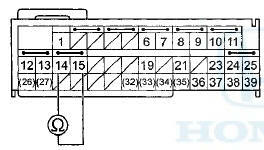 вЂў 2-door: Before replacing the SRS unit, check the SRS unit software version with the HDS. If the software version is not the latest, update the SRS unit software (see page 24-39), and retest. 1. Clear the DTC with the HDS (see page 24-38). 2. Turn the ignition switch to ON (II), then wait for 10 seconds. 3. Check for DTCs with the HDS (see page 24-37). Go to Troubleshooting Intermittent Failures (see page 24-38). If another DTC is indicated, troubleshoot the DTC. 5. Disconnect the negative cable from the battery, then wait at least 3 minutes. 6. 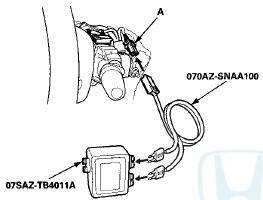 Disconnect the driver's airbag 4P connector (A) from the cable reel 4P connector. 7. Connect the SRS inflator simulator (2 Q connectors) and simulator lead J to the cable reel. 8. Reconnect the negative cable to the battery. 9. Clear the DTC with the HDS (see page 24-38). 10. Check for DTCs with the HDS (see page 24-37). -Open in the driver's airbag first or second inflator; replace the driver's airbag (see page 24-211), then clear the DTC. 11. Turn the ignition switch to LOCK (0). 12. Disconnect the negative cable from the battery, then wait at least 3 minutes. 13. Remove the column cover (see page 20-181), then disconnect the dashboard wire harness 4P connector (A) from the cable reel 4P connector. 14. Connect the SRS inflator simulator (2 O connectors) and the simulator lead J to the dashboard wire harness. 15. Reconnect the negative cable to the battery. 16. Clear the DTC with the HDS (see page 24-38). 17. Check for DTCs with the HDS (see page 24-37). -Open in the cable reel; replace the cable reel (see page 24-225), then clear the DTC. 18. Turn the ignition switch to LOCK (0). 19. Disconnect the negative cable from the battery, then wait at least 3 minutes. 20. Disconnect SRS unit connector A (39P) from the SRS unit (see step 11 on page 24-36). 21. Disconnect the SRS inflator simulator from the SRS simulator lead. Do not disconnect the simulator lead from the dashboard wire harness 4P connector. 22. Measure the resistance between the terminals of both SRS simulator leads. There should be less than 1.0 . -Faulty SRS unit or poor connection at SRS unit connector A (39P) and the SRS unit. Check the connection between the connector and the SRS unit. If the connection is OK, replace the SRS unit (see page 24-228). -Open in the dashboard wire harness; replace the dashboard wire harness, then clear the DTC. NOTE: Before doing this troubleshooting procedure, review SRS Precautions and Procedures (see page 24-25), General Troubleshooting Information (see page 24-36), and Battery Terminal Disconnection and Reconnection (see page 22-91). 4. Check for DTCs with the HDS (see page 24-37). 6. Disconnect the negative cable from the battery, then wait at least 3 minutes. 7. Disconnect SRS unit connector A (39P) from the SRS unit (see step 11 on page 24-36). 8. Check for continuity between the terminals of SRS unit connector A (39P) according to the table. There should be no continuity. 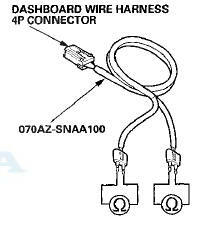 -Short to another wire in the dashboard wire harness; replace the dashboard wire harness, then clear the DTC. Faulty SRS unit; replace the SRS unit (see page 24-228). 10. Disconnect the negative cable from the battery, then wait at least 3 minutes. 11. Disconnect SRS unit connector A (39P) from the SRS unit (see step 11 on page 24-36). 12. Check for continuity between SRS unit connector A (39P) terminals No. 3 and No. 7, and No. 4 and No. 8, respectively. There should be no continuity. -Faulty SRS unit; replace the SRS unit (see page 24-228). 13. Disconnect the driver's airbag 4P connector from the cable reel 4P connector (see step 2 on page 24-33). 14. Check for continuity between SRS unit connector A (39P) terminals No. 3 and No. 7, and No. 4 and No. 8, respectively. There should be no continuity. -Faulty driver's airbag; replace the driver's airbag (see page 24-211), then clear the DTC. 15. Remove the column cover (see page 20-181), then disconnect the dashboard wire harness 4P connector (A) from the cable reel 4P connector. 16. Check for continuity between SRS unit connector A (39P) terminals No. 3 and No. 7, and No. 4 and No. 8, respectively. There should be no continuity. Short in the cable reel; replace the cable reel (see page 24-225), then clear the DTC. NOTE: вЂў Before doing this troubleshooting procedure, review General Troubleshooting Information (see page 24-36), and Battery Terminal Disconnection and Reconnection (see page 22-91), вЂў 2-door: Before replacing the SRS unit, check the SRS unit software version with the HDS. Ifthe software version is not the latest, update the SRS unit software (see page 24-39), and retest. 7. Connect the SRS inflator simulator (2 O connectors) and simulator lead J to the cable reel. Is DTC 11-3x or 11-6x indicated? YES-Go to step 11. NO-Shortto another wire in the driver's airbag first or second inflator; replace the driver's airbag (see page 24-211), then clear the DTC. 13. Remove the column cover (see page 20-181), then disconnect dashboard wire harness 4P connector (A) from the cable reel 4P connector. -Short to another wire in the cable reel; replace the cable reel (see page 24-225), then clear the DTC. 22. Connect the SRS short cancellers (070AZ-SAA0100) to SRS unit connector A (39P) terminals No. 3 and No. 4, and to terminals No. 7 and No. 8 (see page 24-32). 23. Measure the resistance between the terminals of both SRS simulator leads. There should be an open circuit or at least 1 M .
-Short to another wire in the dashboard wire harness; replace the dashboard wire harness, then clear the DTCS. NOTE: вЂў Before doing this troubleshooting procedure, review SRS Precautions and Procedures (see page 24-25), General Troubleshooting Information (see page 24-36), and Batterv Terminal Disconnection and Reconnection (see page 22-91). вЂў 2-door: Before replacing the SRS unit, check the SRS unit software version with the HDS. Ifthe software version is not the latest, update the SRS unit software (see page 24-39), and retest. 3. Clear the DTC with the HDS (see page 24-38). lntermittent failure, the system is OK at this time. -Short to power in the driver's airbag first or second inflator; replace the driver's airbag (see page 24-211), then clear the DTC. 15. Reconrect the negative cable to the battery. 17. Check 1or DTCs with the HDS (see page 24-37). -Short to power in the cable reel; replace the cable reel (see page 24-225), then clear the DTC. 22. Reconnect the negative cable to the battery. 23. Turn the ignition switch to ON (II). 24. Measure the voltage between each terminal of the SRS simulator lead and body ground. There should be less than 0.2 V.
-Short to power in the dashboard wire harness; replace the dashboard wire harness, then clear the DTC. NOTE: вЂў Before doing this troubleshooting procedure, review SRS Precautions and Procedures (see page 24-25), General Troubleshooting Information (see page 24-36), and Battery Terminal Disconnection and Reconnection (see page 22-91). вЂў 2-door: Before replacing the SRS unit, check the SRS unit software version with the HDS. If the software . version is not the latest, update the SRS unit software (see page 24-39), and retest. 7 Connect the SRS inflator simulator (2 O connectors) and simulator lead J to the cable reel. 8. Reconnect the negative cable from the battery. -Short to ground in the driver's airbag first or second inflator; replace the driver's airbag (see page 24-211), then clear the DTC. 13. 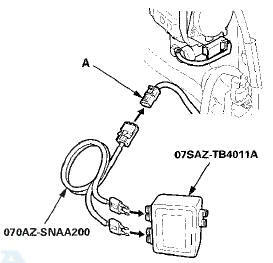 Remove the column cover (see page 20-181 )r then disconnect the dashboard wire harness 4P connector (A) from the cable reel 4P connector. -Short to ground in the cable reel; replace the cable reel (see page 24-225), then clear the DTC. 22. Measure the resistance between each terminal of the SRS simulator lead and body ground. There should be an open circuit or at least 1 M .
-Short to ground in the dashboard wire harness: replace the dashboard wire harness, then clear the DTC. NOTE: вЂў Before doing this troubleshooting procedure, review SRS Precautions and Procedures (see page 24-25), General Troubleshooting Information (see page 24-36), and Battery Terminal Disconnection and Recorifiection (see page 22-91). 6. Open the glove box. Remove the glove box stop on the right side, then let the glove box hang down (see page 20-174). 7. 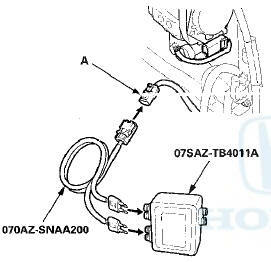 Detach the connector clip, then disconnect the dashboard wire harness 4P connector (A) from front passenger's airbag 4P connector. 8. Connect the SRS inflator simulator (2 O connectors) and simulator lead J to the dashboard wire harness. 9. Reconnect the negative cable to the battery. 10. Clear the DTC with the HDS (see page 24-38). 11. Check for DTCs with the HDS (see page 24-37). -Open in the front passenger's airbag first or second inflator; replace the front passenger's airbag (see page 24-212), then clear the DTC. 12. Turn the ignition switch to LOCK (0). 13. Disconnect the negative cable from the battery, then wait at least 3 minutes. 14. Disconnect SRS unit connector A (39P) from the SRS unit (see step 11 on page 24-36). 15. Disconnect the SRS inflator simulator from the SRS simulator lead. Do not disconnect the simulator lead from the dashboard wire harness 4P connector. 16. Measure the resistance between the terminals of both SRS simulator leads. There should be less than 1.0 . -Faulty SRS unit or poor connection at SRS unit connector A (39P). Check the connection; ifthe connection is OK, replace the SRS unit (see page 24-228). 8. Check for c o n t i n u i t y between the terminals of SRS unit connector A (39P) according to the table. There s h o u l d be no c o n t i n u i t y. 11. Disconnect SRS unit connector A (39P) from the SRS unit (see step 12 on page 24-36). 13. Disconnect the dashboard wire harness 4P connector from the front passenger's airbag (see step 3 on page 24-34). 14. Check for continuity between SRS unit connector A (39P) No. 5 and No. 9, and No. 6 and No. 10f respectively. There should be no continuity. Faulty front passenger's airbag; replace the front passenger's airbag (see page 24-212), then clear the DTC. DTC 12("x" can be 0 thru 9 or A thru F): . -Short to another wire in the front passenger's airbag first or second inflator; replace the front passenger's airbag (see page 24-212), then clear the DTC. 16. Connect the SRS short cancellers (070AZ-SAA0100) to SRS unit connector A (39P) terminals No. 5 and No. 6, and to terminals No. 9 and No. 10 (see page 24-32). 17. Measure the resistance between the terminals of both SRS simulator leads. There should be an open circuit or at least 1 M .
If the connection is OK, replace the SRS unit (see page 24-228J. NOTE: вЂў Before doing this troubleshooting procedure, review SRS Precautions and Procedures (see page 24-25), General Troubleshooting Information (see page 24-36), and Battery Terminal Disconnection and neconnection (see page 22-91). -Short to power in the front passenger's airbag first or second inflator; replace the front passenger's airbag (see page 24-212), then clear the DTC. 12. Turn the ignition switch to LOCK (0). 13. Disconnect the negative cable from the battery, then wait at least 3 minutes. 14. Disconnect SRS- unit connector A (39P) from the SRS unit (see step 11 on page 24-36). 16. Reconnect the negative cable to the battery. 17. Turn the Ignition switch to ON (II). 18. Measure the voltage between, each terminal of the SRS simulator lead and body ground. There should be less than 0.2 V.
NOTE: вЂў Before doing this troubleshooting procedure, review SRS Precautions and Procedures (see page 24-25), General Troubleshooting Information (see page 24-36), and Battery Terminal Disconnection and Reconnect!on (see page 22-91). 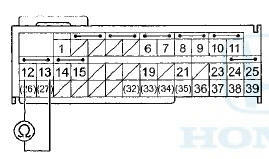 вЂў2-door: Before replacing the SRS unit, check the SRS unit software version with the HDS. If the software version is not the latest, update the SRS unit software (see page 24-39), and retest. -Short to ground in the front passenger's airbag first or second inflator; replace the front passenger's airbag (see page 24-212), then clear the DTC. 16. Measure the resistance between each terminal of the SRS simulator lead and body ground. There should be an open circuit or at least 1 M .
Ifthe connection is OK, replace the SRS unit (see page 24-228). -Short to ground in the dashboard wire harness; replace the dashboard wire harness, then clear the DTC. NOTE: вЂўBefore doing this troubleshooting procedure, review SRS Precautions and Procedures (see page 24-25), General Troubleshooting Information (see page 24-36), and Battery Terminal Disconnection and Reconnection (see page 22-91). 6.4-door: Remove the left side B-pillar lower trim (see page 20-110). 7.2-door: Remove the rear left side trim panel (see page 20-132). 8. Disconnect the SRS floor wire harness 4P connector (A) from the driver's seat belt tensioner 4P connector. 9. Connect the SRS inflator simulator (2 O connectors) and simulator lead K to the SRS floor wire harness. 10. Reconnect the negative cable to the battery. 11. Clear the DTC with the HDS (see page 24-38). 12. Check for DTCs with the HDS (see page 24-37). -Open in the driver's seat belt tensioner; replace the driver's seat belt, 4-door (see page 24-10), 2-door (see page 24-5),then clear the DTC. 14. Disconnect the negative cable from the battery, then wait at least 3 minutes. 15. Disconnect SRS unit connector B (39P) from the SRS unit (see step 11 on page 24-36). 16. Connect an SRS short canceller (070AZ-SAA0100) to SRS unit connector B (39P) terminals No. 12 and No. 13 (see page 24-32). 17. Measure the resistance between SRS unit connector B (39P) terminals No. 12 and No. 13. There should be 2.0-3.0 . -Faulty SRS unit or poor connection at SRS unit connector B (39P) and the SRS unit. Check the connection; if the connection is OK, replace the SRS unit (see page 24-228). -Open in the SRS floor wire harness; replace the SRS floor wire harness, then clear the DTC. -Short to another wire in the SRS floor wire harness; replace the SRS floor wire harness, then clear the DTC. 7. Disconnect SRS unit connector B (39P) from the SRS unit (see step 11 on page 24-36). 8. 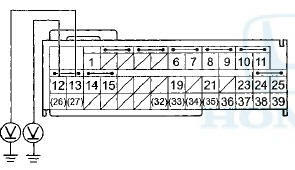 Check for continuity between the terminals of SRS unit connector B (39P) according to the table. There should be no continuity. 5.. Disconnect the negative cable from the battery, then wait at least 3 minutes. 9. Connect the SRS inflator simulator (2 Q connectors) and simulator lead K to the SRS floor wire harness. -Short to another wire in the driver's seat belt tensioner; replace the driver's seat belt, 4-door (see page 24-10), 2-door (see page 24-5), then clear the DTC. 16. Disconnect the simulator lead from the SRS floor wire harness. 17. Connect an SRS short canceller (070AZ-SAA0100) to SRS unit connector B (39P) terminals No. 12 and No. 13 (see page 24-32). 18. Measure the resistance between SRS unit connector B (39P) terminals No. 12 and No. 13. There should be an open circuit or at least 1 M .
-Faulty SRS unit or poor connection at SRS unit connector B (39P) and the SRS unit. Check the connection; ifthe connection is OK, replace the SRS unit (see page 24-228). Short to power in the driver's seat belt tensioner; replace the driver's seat belt, 4-door (see page 24-10), 2-door (see page 24-5), then clear the DTC. 17. Reconnect the negative cable to the battery. 18. Turn the ignition switch to ON (II). 19. Measure the voltage between body ground and SRS unit connector B (39P) terminals No. 12 and No. 13, individually. There should be less than 0.2 V.
-Short to power in the SRS floor wire harness; replace the SRS floor wire harness, then clear the DTC. 5. Disconnect the negative cable from the battery, thenwait at least 3 minutes. 9. Connect the SRS inflator simulator (2 0 connectors) and simulator lead K to the SRS floor wire harness. 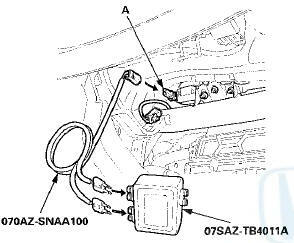 -Short to ground in the driver's seat belt tensioner; replace the driver's seat belt, 4-door (see page 24-10), 2-door (see page 24-5), then clear the DTC. 17. Measure the resistance between body ground and SRS unit connector B (39P) terminals No. 12 and No. 13, individually. There should be an open circuit or at least 1 M .
-Short to ground in the SRS floor wire harness; replace the SRS floor wire harness, then clear the DTC. NOTE: В© Before doing this troubleshooting procedure, review SRS Precautions and Procedures (see page 24-25), General Troubleshooting Information (see page 24-36), and Battery Terminal Disconnection and Reconnection (see page 22-91). 4 Turn the ignition switch to LOCK (0). 6.4-door: Remove the right side B-pillar lower trim (see page 20-110). 7.2-door: Remove the rear right side trim panel (see page 20-132). 8. 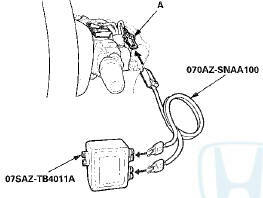 Disconnect the SRS floor wire harness 4P connector (A) from the front passenger's seat belt tensioner 4P connector. -Open in the front passenger's seat belt tensioner; replace the front passenger's seat belt, 4-door (see page 24-10), 2-door (see page 24-5), then clear the DTC. 14 Disconnect the negative cable from the battery, then wait at least 3 minutes. 16. Connect an SRS short canceller (070AZ-SAA0100) to SRS unit connector B (39P) terminals No. 14 and No. 15 (see page 24-32). 17. Measure the resistance between SRS unit connector B (39P) terminals No. 14 and No. 15. There should be 2.0-3.0 .